from the Chancellor’s Innovation fund in 2013 and the Virginia state Zx23 grant in 2015. Through Achieving the Dream’s OER Initiative, CVCC is re-designing three existing degree programs into OER. The two-semester General Education Certificate is targeted at students completing general education courses towards an associate’s degree. The two-year Associate of Arts and Sciences (AA&S) General Studies and Associate of Arts and Sciences (AA&S) Science are for students transferring to complete a bachelor’s degree. Authors: Juville Dario-Becker, Biology faculty; Cynthia Lofaso, Psychology faculty, and Dr. Muriel Mickles, VP of Student and Academic Affairs. The short term goal of CVCC’s OER Initiative is to reduce the cost of college attendance while the long-term impact is to strengthen CVCC’s objective of increasing student success using the Loss-Momentum Framework of connection, entry, progression, and completion. One of the major barriers to students completing degrees is affordability. It is expected that more students will consider enrolling in college when the cost is within their reach, without exerting undue burden on family and personal resources. The savings due to textbook cost will allow students to take more classes, which will accelerate degree completion. Faculty will be able to implement pedagogical innovation such as “on the spot revision” of learning materials as new information supported by verifiable data become available. In contrast to the static printed textbook, OER online resources are easily revised and remixed. Faculty can use such “teachable moments” to engage students in their learning process, and give them ownership of the materials that they help develop. While the administration was supportive of the OER initiative, some faculty and students initially voiced concerns about the rigor and transferability of these courses. Others questioned the quality of OER materials, and the paucity of OER resources in certain disciplines provided ammunition in support of status quo. For some disciplines, there simply were not a sufficient variety of openly licensed resources such as textbooks or lab manuals to convert courses to OER. All faculty interested in teaching an OER course are required to take PATHWAYS, a six-module online training course, to learn about open licensing and other aspects of finding, developing, and customizing OER to be used in the classroom. This time commitment for faculty who had a full teaching schedule proved to be difficult. In early 2013, a CVCC Biology faculty received the Chancellor’s Innovation grant to redesign General Biology as a Z-course ($0 cost) in anticipation of eventually developing Z-degrees. In some courses there was not sufficient OER available and copyrighted materials purchased at cost, typically less than $40. These are designated LT40 or “low cost” courses. The OER degree programs at CVCC are taught as both Z-courses and LT40-courses. The Zx23 grant incentivized faculty to convert several high-enrollment courses into OER. CVCC is developing AA&S transfer degrees through Achieving the Dream’s OER Degree Initiative as one of six colleges in the Virginia Community College system consortium. CVCC is also implementing the Guided Pathways to Success program and the OER team is targeting the intersection of these programs to accelerate degree completion and student success. Students and the community are made aware of the OER initiative through printed brochures and posters. OER sections are coded as such in the course catalog. Local print and broadcast media have also informed the community of this cost-saving measures. It took several semesters of painstakingly “preaching” the virtues of OER, and now that it has permeated the college psyche, faculty are asking how to get involved. Students and parents are looking at the course listing and choosing OER-coded sections. Technical/occupational program faculty are also starting to get on board. In the fall of 2016, CVCC offered 16 OER courses, many taught in multiple sections, in stark contrast to one, at most two sections from Fall 2013 to Spring 2015. At this rate, it is inevitable that just about all of the AA&S curricula will soon be OER. Fig. 1. 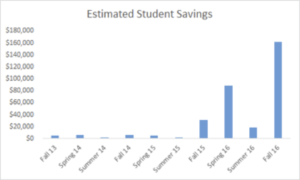 Estimated student savings based on an average of $100 textbook cost per course per student. Students are positively impacted by the savings on textbook cost and we are just beginning to gather concrete figures from the third-party bookstore that serves the college. Embracing OER is a radical paradigm shift for some faculty entrenched in their ways. But there are always some adventurous ones, early adopters willing to take the risk and try something new. Twelve “faculty champions,” veterans of the Z x 23 grant are ambassadors of the OER movement, mentoring new faculty OER adaptors. Their efforts and dedication made possible a combined 39 OER sections taught in Spring 2016. For institutions toying with the idea of developing OER degree programs, look to the faculty who are innovators, the ones who are impatient with, and are willing the break the mold. Look to the administration for encouragement, then find ways to get the monetary support, no matter how small, to incentivize and reward faculty efforts. CVCC is one of the 23 state-supported two-year institutions in the Virginia Community College System offering academic and technical curricula to support the needs of the city of Lynchburg and the counties of Amherst, Appomattox, Bedford and Campbell. Established in 1966, CVCC promotes access and success for its diverse population of over 5000 students with approximately 22% underrepresented student enrollments. The only public higher education institution within 60 miles of its main campus, CVCC has articulation agreements with many 4-year colleges and universities, allowing students to complete the first two years of their bachelor’s degree at CVCC, for substantial savings in tuition and other related costs.